For more than 50 years after it was launched, SS Earnslaw carried freight and people to and from remote lakeside settlements. Affectionately known as the ‘Lady of the Lake’, the ship has also been used for scenic cruises since the 1970s. During the 1900s the government decided to invest in a new lake steamer to cater for increasing tourist numbers on Central Otago’s Lake Wakatipu. Their preference was for New Zealand shipbuilders. The Dunedin naval architect Hugh McRae provided the design and the tender was given to John McGregor and Co., who had built Otago Harbour ferries. McGregor’s completed the keel in July 1911. Once the framing was completed, shipbuilders dismantled the ship plate by plate. Each part was meticulously numbered and transported by rail to Kingston, at the southern end of Lake Wakatipu, for reassembly. 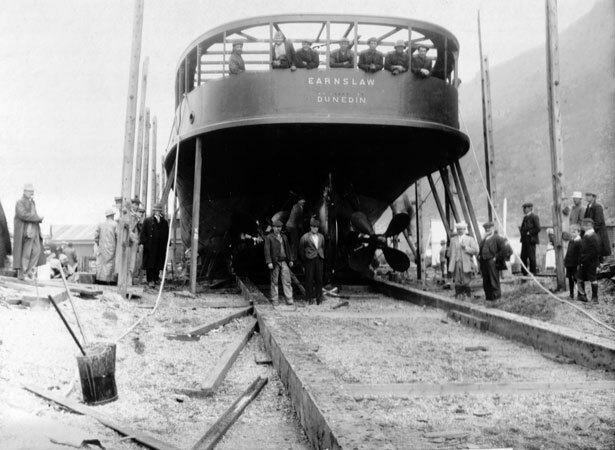 Three months after building began, the Earnslaw was launched in front of a large crowd. The minister of marine captained the steamer on its maiden journey to Queenstown. The first scheduled voyage took place in October that year. Queenstown marked this event with a holiday. We have 1 biography, 9 articles, related to SS Earnslaw launched on Lake Wakatipu .